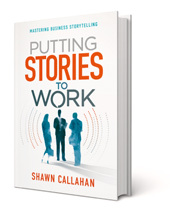 Shawn is the author of Putting Stories to Work and one of the world’s leading business storytelling consultants. He is the founder of Anecdote, the world’s largest business storytelling enterprise that operates in over 20 countries in 6 languages. He works around the world helping leaders find and tell their stories so their message is clear and memorable. He has had the privilege to assist Global 1000 companies such as IBM, Shell, Mars and KPMG. He started his working life as a geographer and archaeologist, then moved into information technology with the likes of Oracle and IBM. His story work began in 1999 while he was still with IBM, applying complexity theory to business issues. It was a time when story-based approaches to leadership development and employee engagement were definitely on the fringe, but that was soon to change. In 2004 Shawn founded Anecdote with the clear purpose of restoring humanity to the workplace, using story work as its method. This includes helping companies craft and tell their strategic story, teaching business leaders to be better storytellers, and collecting stories – a technique harking back to Shawn’s archaeology days – so that employees can work out for themselves what needs to change. It is an approach that continues to break new ground. Anecdote is now in the privileged position of being the largest and most experienced business storytelling enterprise in the world. It crafts strategic narratives for companies, teaches leaders to find and tell effective business stories and helps embed company values in everyday actions throughout a company. Based on Shawn’s book of the same name, this presentation gives the audience a practical approach for becoming a better communicator using oral storytelling. Based on years of research and practical experience Shawn reveals how every leader can be more memorable, better understood and authentic by using one of the most underutilised sources of power in modern business – the humble story. How to master the four disciplines of business storytelling. The best sellers are storytellers. So how does storytelling work in the sales process and what types of stories should you tell when? This session gives sellers practical tips on how to build rapport, illustrate value and deal with objections using narrative techniques. A systematic approach to using stories to embed your company’s values in action. How to build engagement after you are presented with your employee engagement survey results.